There has been no contact with the boys, aged 11 to 16, and their coach since they went into the Tham Luang cave last weekend and were hemmed in by heavy rains that blocked the entrance. The desperate, round-the-clock search for the team has been beset by torrential downpours that submerged tunnels near the entrance, blocking divers from going on. 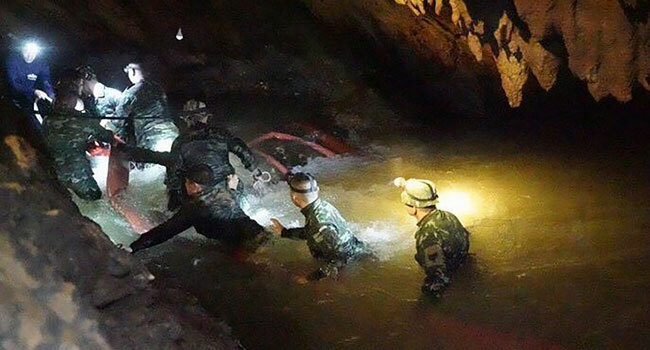 But Navy SEAL divers nearly reached a T-junction in the depths of the cave just two or three kilometres (one to two miles) from where the boys are believed to be, Chiang Rai governor Narongsak Osottanakorn said. Water levels inside the complex labyrinth of tunnels finally dropped thanks to dozens of pumps set up to drain the pools even as heavy rain continued to pound the area near the Myanmar and Laos borders. “The situation is better today than yesterday and the day before. Water has receded considerably and we are pumping out water in all chambers (near the entrance),” Narongsak told reporters. As the search for the boys hit its seventh day, attention turned to their chances of survival inside a cave with little or no food and light. The group likely has access to fresh water — either dripping in through rocks or rushing in through the entrance — but experts warned that runoff water from nearby farms could carry dangerous chemicals or bacteria. “If they drink the water in the caves and it makes them sick it could hasten the problem that they are in, but if they don’t drink it then they are also in trouble,” Anmar Mirza, coordinator of the US National Cave Rescue Commission, told AFP. But even without food he said young, athletic boys could “easily live for a month or a month and a half” but the main challenge now would be mental resolve. “The biggest issue that they are facing right now if they are alive is psychological because they don’t know at what point they might get rescued,” Mirza said in a telephone interview from the US state of Indiana. Cartoon images of the smiling boys being found by divers circulated along with messages for the team, such as “Stay Strong, We are Coming”. One team was drilling into a 40-metre (130-foot) chimney that led to a muddy chamber, which the governor described as a “promising” lead. “We have been rotating our staff into the chimney since yesterday, they are inside… still searching and we are waiting for their findings,” Surachai Thathes, chief of the parks ministry rescue team for northern Thailand, told AFP. Stone-faced relatives kept vigil under a makeshift tent near shrines where monks are leading prayers. Stretching 10 kilometres (six miles) and with complicated, snaking pathways and narrow corridors, Tham Luang is one one of Thailand’s longest and toughest caves to navigate. Officials said the boys know the site well and have visited many times before, buoying hopes that they might have trekked to a large airy chamber in the centre called Pattaya Beach. Rescuers found footprints and handprints in a chamber near that spot earlier in the week, further in from where they found the kids’ football boots, backpacks and bicycles.